It takes a lot of people coming together to make rescue work successful.We have a great community of supporters who work hard and share generously to help save abandoned and homeless animals in North Georgia. Thank you seems like such a small phrase for everyone listed and everyone not listed, but it comes from the bottom of our hearts. You are the cat's meow and the dog's bow wow!! In 2017, our expenses ran over $80,000 - and that was with an all-volunteer staff and network. It included $62,726 for veterinary care, including $18,912 for spay & neuter. We spent $11,938 on medicines, including flea and worm treatments, antibiotics and various ointments. Thanks to donations of food and supplies, we kept our out-of-pocket expenses for those items at $5,327, but that's still a chunk of money. Our supporters came through for the homeless dogs and cats of our area! We are a part of Bissell's Partner for Pets program. When we posted two shelter kittens as urgent, Baylee came to their rescue! She had earned $20 from a fundraiser at school and wanted to donate her money to save these two kittens. She talked with her parents and her grandparents and a few other friends and got them to match her donation and she raised a total of $120!! 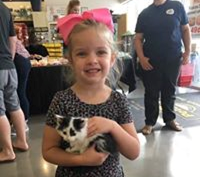 She brought her donations to an adoption event and met the two kittens she had a direct impact on saving. This child is precious and we are so thankful for her kind and giving spirit and love for animals. It doesn't get much better than this! This list of people, businesses and groups that help and work with us is far from complete. It's in no particular order and we'll be adding more. We want to recognize as many people as possible - and thank them for all they do to help some of the most vulnerable creatures on earth. We appreciate you more than we could ever express! - VCA Catoosa Animal Hospital - Chattaneuter - Dixie Day Spay - National Spay Alliance - Petsense/Fort Oglethorpe - K-9 Tub Time/Ringgold - Rescue Bank Pet Food Pantry - Team Hayes/Crye-Leike - Ringgold Telephone Company - Modern Woodmen/Shane Catlett - Blue Mountain Yoga/Ringgold - Flintstone Pharmacy - Papa John’s Pizza/Fort Oglethorpe - Richard’s Restaurant/Ringgold - Brankel Properties, Inc. - Catoosa County Library - Morton Memorial Presbyterian Church - Rescue Bank Pet Food Pantry - Graysville Elementary School - Price Drugs/Ringgold - Parkway Pharmacy/Fort Oglethorpe - Larry and Linda Chastain - Naomi & Karen Brown - Richard Stansbury - Teresa Ware and WarePet.com. Over the years, we have received grants from Best Friends, PetSmart Charities, ASPCA, Two Mauds, Petco Foundation, Georgia Department of Agriculture, The Banfield Foundation, Bissel Pet Foundation, Greg Biffle Foundation, Pedigree Foundation, American Humane Association. It is only through the ongoing support of our community, grants and other help from organizations devoted to animal welfare that we can keep saving and helping animals. The need never ends and for that reason the need for funds never ends. Your help makes all the difference in the lives of homeless animals.